Tourist information for North-West Ireland from Drive-Alive. Touring in Cavan Monaghan Leitrim Donegal by car. Tourist information for North-West Ireland. Drive-Alive Holidays in North-West Ireland. North-West Ireland comprises the counties of Sligo, Donegal, Leitrim, Cavan and Monaghan. Donegal and Sligo contain dramatic coastal scenery whilst inland Leitrim, Cavan and Monaghan are dotted with loughs and rivers and provide some of Ireland's best angling waters amongst unspoilt country offering a taste of Ireland away from the tourist trail. A driving tour of this region might start in the west in County Sligo. The Ox Mountains around Coolaney is a great area for hill walkers, cyclists, salmon fishing, falconry and horse riding. Coolaney has been awarded "tidiest village in Ireland" six times! Sligo town is well worth visiting, a lovely old town on the banks of the river Garavogue and close to many beautiful sandy beaches. County Sligo has more prehistoric sites than anywhere else in Ireland. Northwards is what many consider Ireland's most spectacular county, Donegal. The precipitous cliffs, windswept headlands and golden beaches of its long and rugged coastline are the main attraction. From Donegal town in the south, divert via the Alpine-like Glen Gash Pass en route to Rossnawlagh, the ideal base for exploring the beautiful and rugged northwest. The area is a golfers paradise with 3 excellent championship links courses nearby. A little further up the coast Narin and neighbouring Portnoo are both attractive coastal villages. 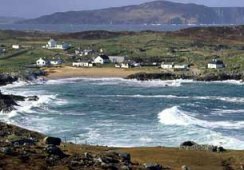 The beach in Narin is a glorious stretch of sand, and the coast features many small sandy bays, rocky headlands, and river estuaries. In the north Dunfanaghy is a discreet but popular resort. There are vast sandy beaches and nearby Horn Head has some of Donegal's most spectacular scenery. Rathmullan is on the shores of Lough Swilly in North Donegal. This beautiful part of Ireland offers walking, angling (including sea angling in hired boats), sailing, horse-riding and cycling. Golfers are well-catered for with 4 courses within 45 minutes' drive. Just 20 miles will take you to the Glenveagh National Park, 14,000 acres of mountains, bogs lakes, glens and woodlands with a herd of red deer. If you prefer unspoilt countryside with loughs and rivers at every turn, great fishing, walking, cycling and horse-riding, then counties Leitrim, Cavan and Monaghan are for you. Try the north-east of County Leitrim, in the triangle formed by Ballinamore, Bawnboy and Carrigalen, between Lough Allen and Lough Oughter. where you'll aslo find the Killykeen Forest Park. On the way back east, stop in Kingscourt in the far east of Cavan and admire the stained-glass windows in St Mary's Church.